The 10 best moments from the week that was. In a closely contested 3-2 overtime win by the Senators on Thursday night, all five goals were scored by players age 23 and under. The league is in fine hands with names like Conacher, Galchenyuk, Subban, Turris and Zibanejad producing offense. It was Kyle Turris who ended the exciting game with this overtime winner. On Tuesday night, Crawford continued his career season in goal for the Blackhawks. Crawfordturned aside 25 shots from the Wild, including five from Minnesota star Zach Parise, who was buzzing all game. San Jose was able to advance to the second round with a huge overtime goal by Patrick Marleau. In a back-and-forth game with a remarkable 80+ shots on goal, it was ultimately Marleau who was able to break the stalemate in the extra frame. Witnessing all the action was Rock and Roll legend Neil Young, a huge San Jose supporter. Wednesday night continued with some of the best action in professional sports: sudden-death overtime hockey. Kings defenceman Slava Voynov was the hero in Game 5 of the Los Angeles/St. Louis series, while Ducks forward Nick Bonino needed less than two minutes to end Game 5 in a battle against the Red Wings. Tomas Vokoun got the call in Game 5 of the electrifying Islanders-Penguins series, making his first playoff start since 2007. Vokoun called upon his veteran experience to silence the potent Islanders offense, making 31 saves for the win and earning him the game’s first star of the night. Facing elimination, Toronto met a tough task going into an emotionally charged TD Garden in Boston with their backs against the walll. Despite facing 44 shots, nearly half of which came in the third period, the Leafs were able to hold on for a 2-1 victory. James Reimer of Toronto and Tuukka Rask of Boston were the story of the game, with the goalies earning the first and second star respectively. 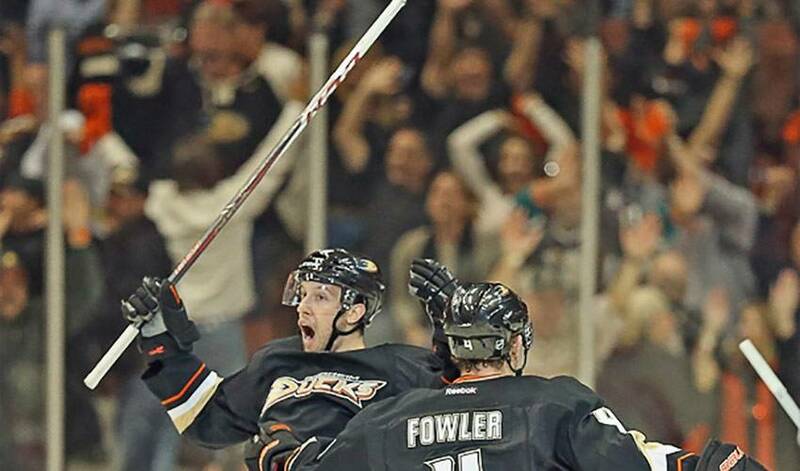 The Red Wings were in tough against the second-seed Anaheim Ducks. After a seesaw regulation time, it was Captain Henrik Zetterberg who saved the day at 1:04 of overtime. Zetterberg’s goal gave the Joe Louis crowd a night to remember, forcing a Game 7 on Sunday night. It what many have dubbed the most physical, grueling series of the first round, the Kings were able to defeat the Blues on home ice in Game 6. This punishing matchup saw numerous close battles, but it was Dustin Penner’s goal with one second left in the second period that was the difference in the series. The Kings are now one step closer to repeating as champs. Known as one of the game’s premier shutdown defencemen, Penguins rearguard Brooks Orpik took on a different role Saturday night in New York. Orpik stepped into a slapshot in overtime, scoring his first playoff goal in 106 games. The goal gave Pittsburgh the series in six games, despite a roaring Islanders crowd reminiscent of their 1980s dynasty. Sunday night was the definition of playoff intensity. With three huge games held one after the other, it was one goal that decided all three contests. The Rangers were able to force a Game 7 with a win at home against the Capitals, with Derick Brassard scoring the only goal in a 1-0 win. In Toronto, Phil Kessel recorded the winning tally as the Maple Leafs held off the Bruins for a 2-1 victory, also forcing a deciding Game 7 in Boston on Monday night. Both series will have fans across the League on the edge of their seats Monday night, with the winner of each game set to face the other in the second round. The final game of the night saw the Red Wings defeat the Ducks in a Game 7, with Finn Valtteri Filppula recording the winning goal.